Announcing 2013 Award Winning Hands-Free Pet Gate! - Richell USA Inc.
Home >> Blog >> Uncategorized >> Announcing 2013 Award Winning Hands-Free Pet Gate! 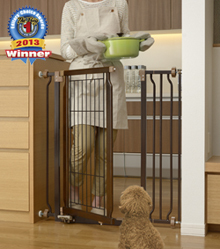 Announcing 2013 Award Winning Hands-Free Pet Gate! GRAND PRAIRIE, TX, USA (August 12, 2013)- Richell USA is excited to announce that Pet Product News has awarded our new Hands- Free Pet Gate a winner in the 2013 "Editor's Choice Awards!" Busy pet owners often have their hands full from groceries or dog food. Made of eco-friendly rubber wood, Richell's newest product includes a specially designed double sided foot pedal that will make getting through the gate easy for those busy moments when hands are occupied. Great for small to large dogs, the pet gate has an upper and lower locking system that opens in both directions. As an option, gate can also be opened using one hand. Pet owners can now move in an out freely, while keeping a pet confined to its special area. The new pet gate definitely adds a new spin to Richell's popular line, "keeps pets confined, but not you!" The Hands-Free Pet Gate (patent pending) measures 28.2-36 x 8.7 x 34.6". One Option Frame is included. A second Option Frame may be purchased separately to add even more width up to 41.3". Only one Option Frame can fit per side. Thank you Pet Product News! And a special thanks to our design team at Richell Corporation!